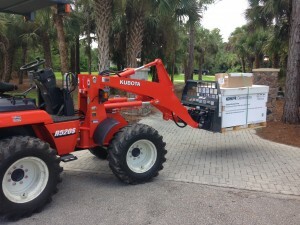 West Coast Generators welcomes our newest team member, Kubota R520S. Kubota R520s works day and not without breaking a sweat. This guy can lift 4400 lbs over his head 13′ high with a 2000 lb counter weight on his back.. He can reach into semi tractor trailers and lift the heaviest of generators up and set them gently into place. If the terrain is rough then Kubota can get there with all wheel drive. He has a 4 cylinder diesel engine with a 2 speed hydrostatic drive. Not only can Kubota R520S lift heavy generators but within a matter of moments you can change attachments for a wide variety of tasks. He is truly a valuable asset. West Coast Generator would like to thank Erich Sperber at Florida Coast Equipment for making this all possible. This place is like a candy store for any man and they offer many types of equipment. Stop by and check them out 0r call them at 239-435-1667. This Kubota R520S truly makes our job much easier. Look for this machine on the road near you! We will come to you and give you a free estimate and educate you on all of the latest equipment.